The future is only a figment of imagination, it is not real until it becomes the present. Most of my past imaginations of the future have become a reality, although slightly different from what I might have thought at the time. Now, as I envision the path ahead I create it – with room for the unexpected departures from the road. I don’t know exactly how or when I will get there but I am going. My husband and I have long planned to move to his home country of Australia. In fact he is there now trying to pave the way. If that becomes our reality then I hope to spend some time traveling around the South Pacific – a lifelong dream, so I have no pictures of that yet. 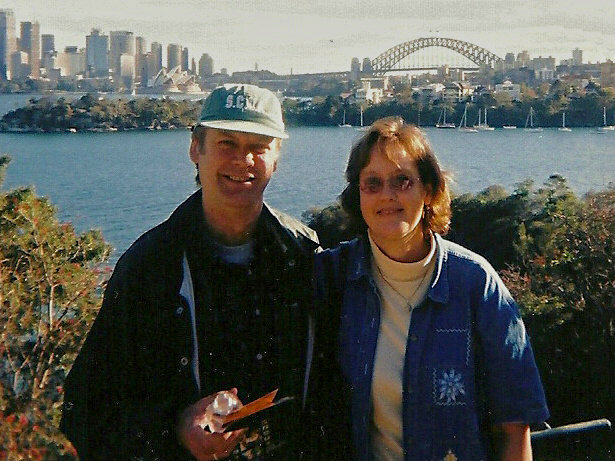 Only this photo with the Sydney Harbor Bridge in the background from 2003, when we took the kids to visit family. We’ve been planning to move back ever since. In the near future I hope to do a bit more traveling closer to home. I’d really like to take a few more road trips in the states. Both my husband and I want to explore the west a lot more; and I’d love to go to Mexico again. I have to eat breakfast by the Sea of Cortez at least one more time before I die. Australian – and the South Seas – what a grand adventure. Yes, it’s a great goal to work toward.